The gentlemen and ladies of Japan invite you to leave the real world behind you for a couple of hours and join them in the ‘topsy-turvy’ world of Gilbert and Sullivan! EDGAS are performing The Mikado in the King’s Theatre Edinburgh nightly from Tuesday 12 March to Saturday 16 March, with a Saturday matinée. And there’s a fun-filled pre-show talk at 2.00pm before the Saturday matinée performance that is designed just for the under-12s – take your children/grandchildren and pay just £9 a head (including accompanying adults). More details on the poster linked to the image, or at this link. This was indeed a most innovative, imaginative production of perhaps one of the less popular G&S operettas. Normally set in the Victorian period, this production was updated to the Roaring Twenties and, whilst every principal character remained as written, each company member depicted a famous character from that era. As the curtain rose revealing a charming, colourful rural village in Ploverleigh, the guests waiting to celebrate the wedding of Aline and Alexis were not just a ‘chorus’ of villagers but 28 celebrities such as Hercule Poirot, Jeeves, Winston Churchill, Agatha Christie, Mary Pickford etc. etc. A great deal of thought must have gone in to researching and selecting the characters and the result was quite ingenious, with every cast member an individual who had a part to play. The impact of such a variety of costumes was quite stunning. There was also a solid principal line up. Aline (Louise Thomson) and Alexis (Neil French) were a well matched couple both giving vocally strong solo performances and their voices blending beautifully in their duets. Alexis has the rather naive idea of summoning the Sorcerer, John Wellington Wells to add a ‘love at first sight’ philtre to a teapot so that all who drink the tea will fall asleep and find love with the first person they see when they awake. This inevitably led to some bizarre pairings. Nathan Dicks was a spritely, spirited Sorcerer displaying real vocal agility in his patter song. The finale of Act 1 when the spell is administered was most effective with ghosts, flames and flashes and the slow motion and lighting as people fell asleep was most atmospheric. 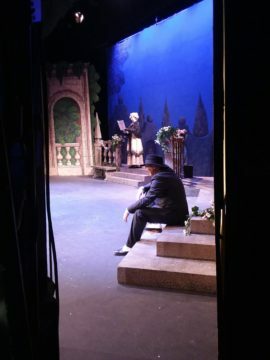 Robin Ożóg gave a polished performance as the upper crust Sir Marmaduke trying to hide his true feelings for the stylish Lady Sangazure (Liz Landsman) who brought some of the most comedic moments in the piece particularly in her duet with the Sorcerer himself when she falls for him. The lower class Mrs Partlet was ably played by Jan Renton. Both she and her love-sick daughter Constance (Fiona Main) maintained their Somerset accents throughout and were a good duo. Fiona’s characterisation of the spectacled, freckle-faced somewhat gauche Constance was brilliant, with great comedy timing. The love-sick Constance is suffering from unrequited love from the vicar Dr Daly and Ross Main was well suited to this part both in appearance and vocally. As in many of the Savoy operettas, there are wonderful ensemble numbers particularly in Act 2 where the blend of voices was excellent. The choral singing throughout was full-bodied with harmonies coming through strongly. 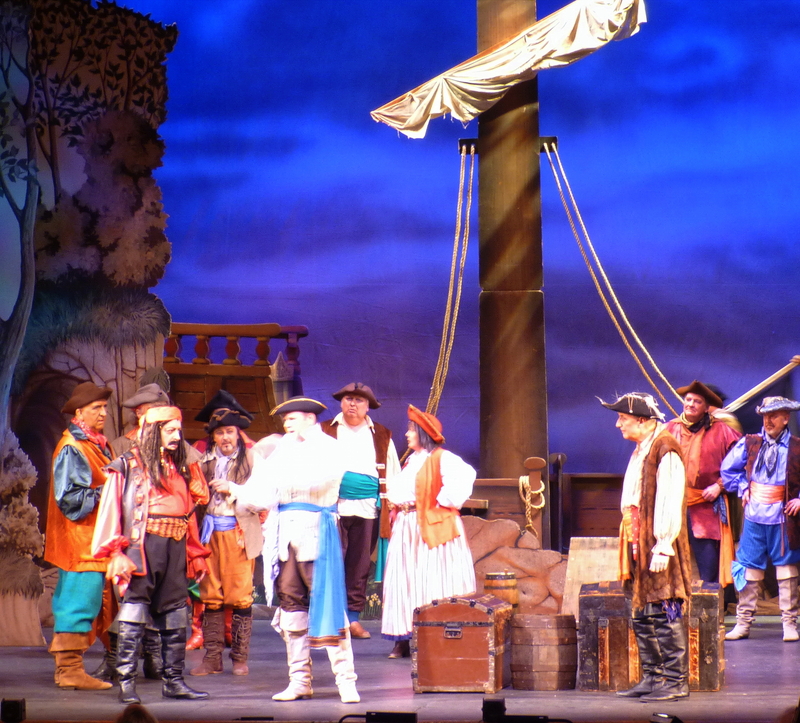 The Sorcerer may not be one of G&S’s most well-known operettas but it is full of fun and wonderful music and this company gave credit to both the score and the script. This was certainly a most original and magical production which was extremely well directed and very well received by a most appreciative audience. 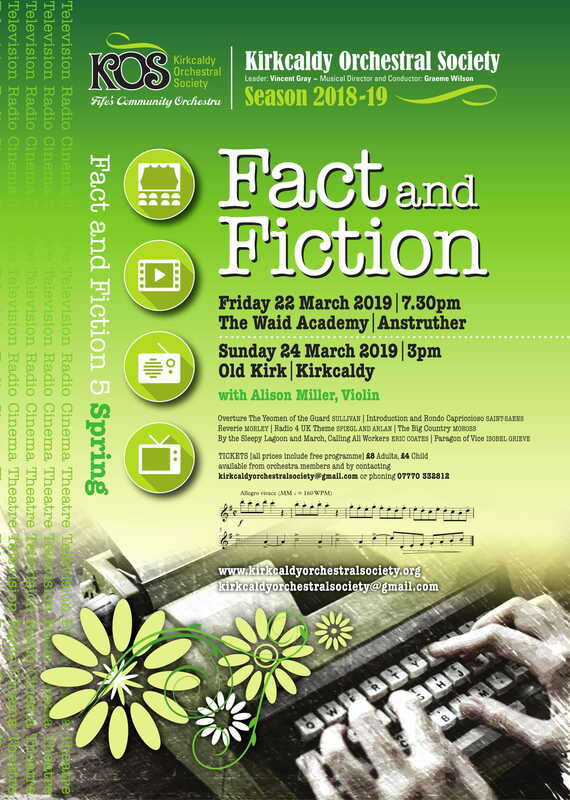 At it explains in a recent What’s On post, our friends at Kirkcaldy G&S Society are next to present a show. 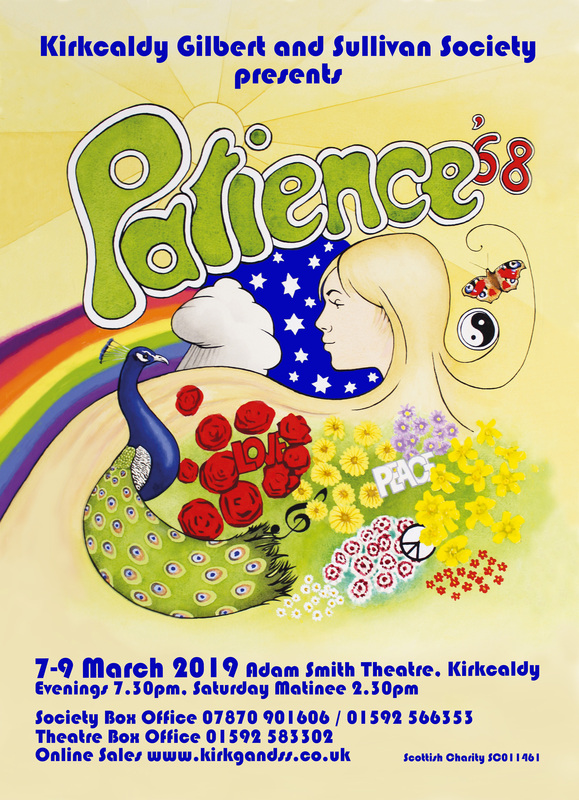 As with our own Sorcerer, the interpretation has been time-shifted, this time to 1968, so we can anticipate some interesting ‘flower power’ twists. We won’t “have to be contented with a tulip or lily”! We wish all the best to the many of our members who are taking part in the production. If you want tickets, talk to Robin Ożóg – “Such an opportunity may not occur again”!